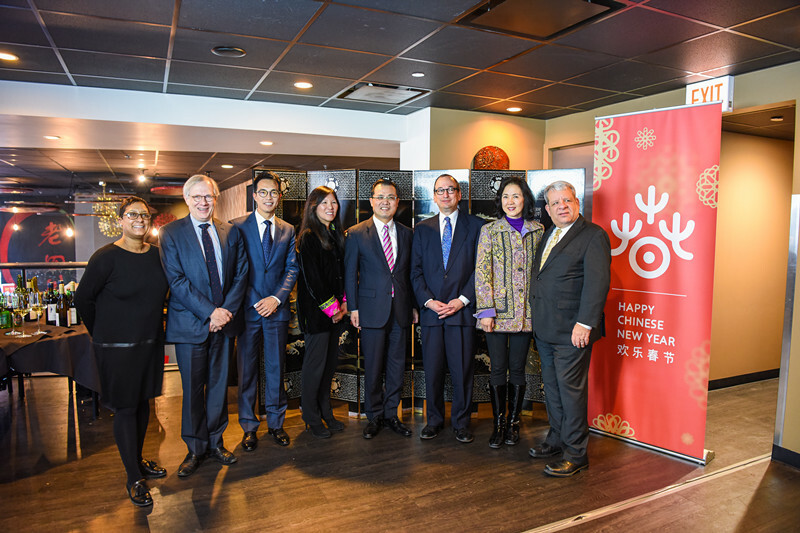 On January 14, Chinese Consulate General in Chicago and Choose Chicago co-hosted the kick-off reception for 2016 Chinese New Year Celebration & Yearlong Cultural Exchanges Activites. Mr. Zhao Weiping, Chinese Consul General to Chicago, and Mr. Steve Koch, Deputy Mayor of Chicago, delivered remarks at the reception. Represtatives of more than 20 leading cultural and commercial organizations attended the reception including World Business Chicago, Choose Chicago, Art Institute of Chicago, Chicago Symphony Orchestra, WFMT Network, Chicago Botanic Garden, United Airlines, Sophia's Choice, Chicago Confucius Institute, Chicago Chinese Culture Institute, Chicago Chinatown Chamber of Commerce, Fashion Outlets of Chicago, 360 Chicago, Shops at North Bridge. The event was covered by Xinhua News Agency, CCTV, Chinadaily, World Journal, China Press, Chicago China News & Digest, Sinovision and China Star TV ect. 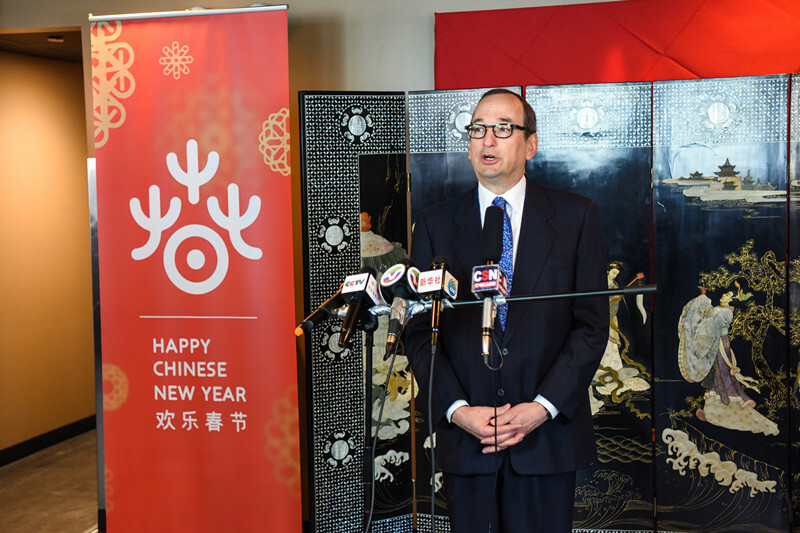 In his remarks, Consul General Zhao Weiping spoke highly of the City of Chicago for its great efforts in promoting cultural exchanges between Chicago and China including hosting annual citywide Chinese New Year Celebration. 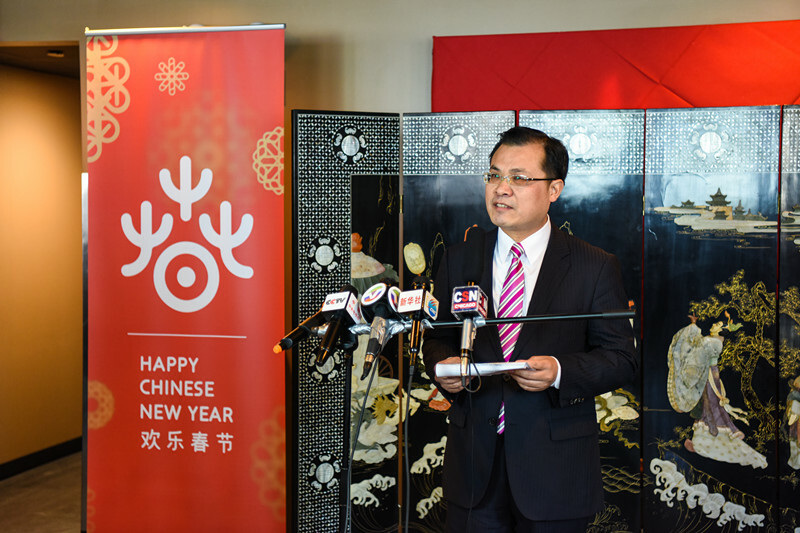 Zhao said that China-Chicago cultural exchanges in 2016 will be very active, which will further enhance mutual understanding between the peoples as well as two-way tourism and will make contributions to implementing the consensus of hosting China-US Year of Tourism as reached by the leaders of our two countries. 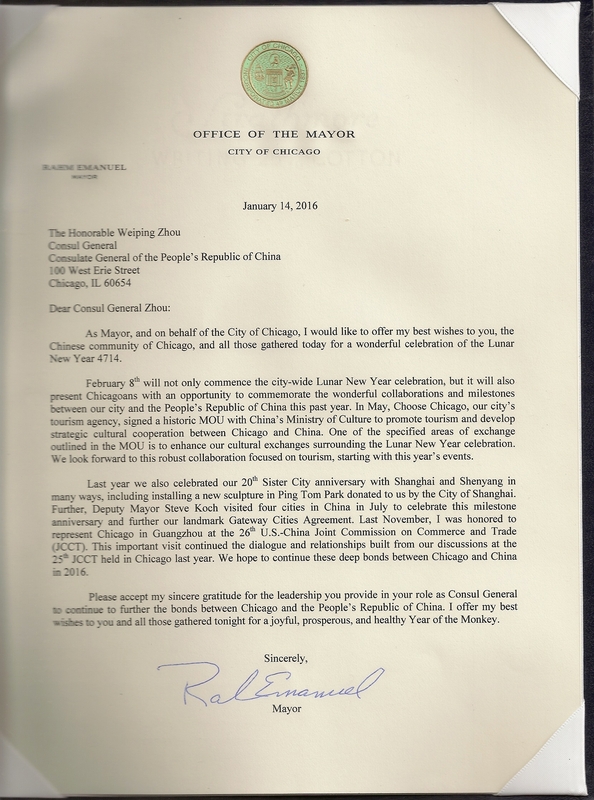 Mayor Emanuel said in his congratulating letter to Consul General Zhao Weiping that the City of Chicago is very happy to host Chinese New Year Celebration activities and promote cultural exchanges with China. And Chicago is ready to deepen its relationship with China in 2016. 2016 Chinese New Year Celebration in Chicago will be on Febuary 8-22 including the following activities: Beijing Long Yun Kong Fu troup's performances at Chicago Cultural Center and Reva & David Logan Center of University of Chicago, China Broadcasting Chinese Orchestra's concert at Chicago Symphony Center, Window Display at Macy's on State Street, students arts troupe from Ren Da Fu Zhong at public schools, Chinese Arts & Culture Documentary Festival at Chicago History Musuem and Botanic Garden. Throughtout the year, China will send arts troupes and cultural delegations to participate in Chicago World Music Festival, EXPO Chicago, Asian Pop-Up Cinema and CFAS Eight Tones Concerts.